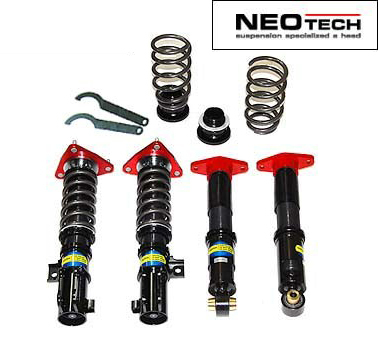 NeoTech introduces their VE-type coilover system for the 2012+ Hyundai Veloster & Veloster Turbo. One of the most respected coilover manufacturers in Asia for regular street driving, autocrossing, and track! The mounts and primary coilover components are constructed of 6061 billet aluminum, which is not only lightweight and rock solid, but it is rust-proof as well. There is a zinc coating on the steel shock tubing which resists rusts and other chemicals (such as road salt). A high end coilover system will have a monotube design to separate the gas and oil components inside the cylinder--which aids in dissipating head and allow for inder dampening adjustments. PRICING INCLUDES SHIPPING TO ANY DESTINATION IN THE WORLD. Please note that some exceptions will apply, such as certain areas of the Middle East, South America, etc. This is due to restrictions of the EMS shipping services that various countries may have.